As the title of the post is indicating that the today’s post is all about “How to hide last seen on Facebook Chat”. I know many peoples want to know the trick to hide last active on facebook chat, and that is why today I am writing this post for all my readers. You might be searching on the internet for the terms like “how do I stop Facebook showing when I was last online”. Well, the solution to your all the queries related to hiding facebook last seen will be explained in this article today. The reason behind hiding last active on Facebook would be many and we all want the privacy of our personal profile, so why should not we allow to hide our facebook last seen? Facebook dont provide the solution to this issue officially but we have some tricks to hide last active on Facebook chat that I am going to explain in this article. 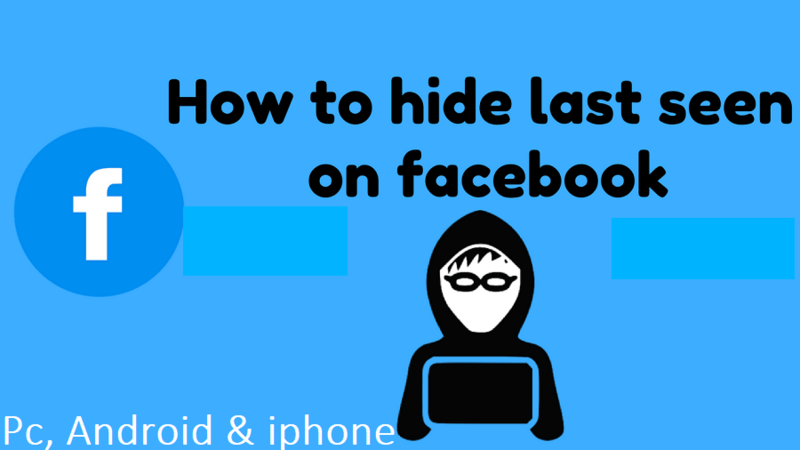 I will tell you the trick to hide last seen on Facebook for all the devices including Windows, Android & iPhone. In this method of hiding last active or last seen on Facebook, we will use some extensions and plugins to hide facebook last active. In this article, I will tell you “How to hide last seen on facebook messenger Android”, “How to hide last seen on facebook messenger iPhone”, and “How do I stop Facebook showing when I was last online on Chrome & Mozilla Firefox. So let’s get started and start with the trick to Hide facebook last seen on Google Chrome. As I have already told you above in this method we are going to use an extension to hide last seen on facebook chat. We will use Facebook Unseen Chrome extension to hide last on Facebook in Google Chrome. Let’s checkout the Google chrome trick to hide last active on Facebook Chat. First of All, You will need to download and install Google Chrome Browser on Your PC (If you dont have it already). Now when you successfully installed Google Chrome on your PC, Open it. Now Navigate to the Menu bar (at the top right corner) > More Tools > Extensions and scroll down to bottom, Click on Get more Extensions or Just Click here. Type “Unseen for Facebook” in the Search Bar (Check screenshot). Here you will see “Unseen for Facebook” extension, just click on Add to Chrome button. Now, wait until it installs on your google chrome, once installed then you dont need to do anything. That’s it! Now you will be able to see all the messages from your friends without showing your last seen to them. In this method of hiding last seen on facebook chat in Mozilla Firefox, we will use a plugin called “Facebook stealth”. You just need to install and activate the plugin and you will be able to hide your last seen on facebook chat. If you don’t have Mozilla Firefox install on your Pc then you need to download it first from here. Now download and install Facebook stealth plugin from here. Once you install and activate the plugin on Mozilla Firefox then it will automatically start hiding your last seen on Facebook chat. That’s it! Enjoy, Now you have successfully hide your last seen on Facebook chat on Mozilla Firefox. Using this trick you can hide the last seen on any of the messaging application like Viber, Telegram, WhatsApp, Facebook or Facebook Messenger. In this method, we will use an Android application called “Unseen”, which will help us to hide last active on Facebook messenger or on any other messenger. First of all, download and install Unseen Android app on your Phone from here. Once you successfully download and install the Unseen app on your Android device, now give it notification access (Enable Unseen). Now when you open the Unseen app, click on the setting icon at the top right corner. Here you will see all the options to enable unseen for all the applications including WhatsApp, Viber telegram, Facebook messenger etc. You can enable unseen for any application you want and you are done. Check the screenshots gallery given above to know more. Now after using this method of “How to hide last seen on facebook messenger android” you will be able to read all the messages from your friends right in the unseen app without letting your friends know that you have read their messages and also your last seen will be hidden. This is the simple and easiest way to hide last active on facebook messenger iPhone. You don’t need to use any plugin or app in this method. Just follow the simple steps given below to hide last seen on facebook chat on iPhone. Open facebook messenger on your iPhone and Click on Peoples tab. Here you will see messenger and Active tab. Just click on the Active tab and disable active, just by sliding the toggle. Once you are done then you will be able to hide your last seen. Now your friends will not be able to see when you were online on your facebook messenger. However if your goes online then they might see that you are online and the same applies to you. So these are the best tricks to hide last seen or last active of facebook chat easily. I hope you find this article helpful and it resolved you’re all the queries. If you still have any question then let me know in the comments. If you like this article then don’t get shy to share it on social media to support us. Thank you and keep visiting!